Hopefully, to Daz when the time comes, but the jury is still out. Here's a render to show you some of the pieces in the expansion. 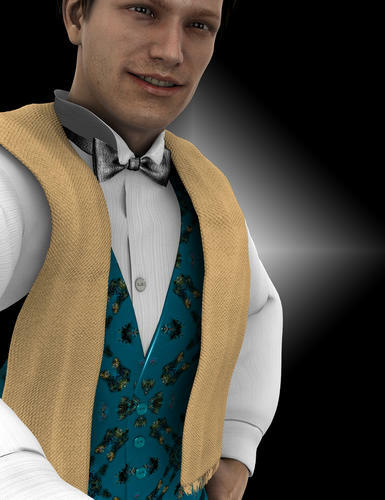 Pictured here are the bow tie, waistcoat and scarf. There are still extra morphs to come, and things will layer better when they do, but the first expansion also has morphs, as you can see, for the shirt to make it into a bow tie collar. This expansion also contains an Ascot cravat, shoes and socks and a briefcase. I'll post renders of those when I've slapped on some textures. Edit: and a Fedora hat as well. Pleased you like it, Richard. Here are the shoes and socks. 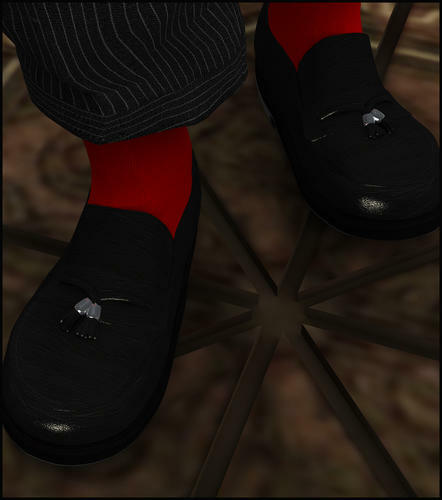 The textures don't seem to have applied properly to the sole and heel, so ignore that. And I forgot to mention that the Expansion has a belt in it as well. 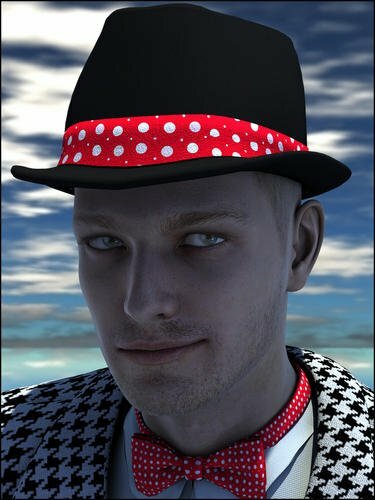 Just working on rendering the cravat and Fedora. Are the socks attached or separate from the shoes? Would like to know that too. Seperate socks would be great. The shoulders in some of the pics looks very "80's"-style (like they have pads on the shoulder. And I also think, that the seams of the pants and at the arms-shoulders connction should be a little bit more visible. But all in all a definitevely Must-Have and thanks to you both to put your hands on this. Socks are joined to the shoes. They can be textured separately, or made invisible, but if you want completely separate socks there are other products out there that include them. The expansion already has seven items in it that layer with the original suit. This is incredibly difficult to do and is a ton of work for SickleYield. To add separately rigged socks would have raised the price of the set beyond the utility of the socks themselves. There are ton of morphs in the jacket, including ones what will do what you want. We are mainly showing the big shoulders in these renders here because people asked for them earlier in the thread, and most people seem to want them. They are a morph also. The default suit doesn't load with the big shoulders. We have redone the suit and Daz is happy with it now. I've also redone all the textures because, although I love the pinstripes, they are overly vulnerable to distortion when extreme morphs are applied. Here's a render of the redone suit. There are more organic wrinkles and extra morphs. The hat, belt, briefcase and shoes are in the first expansion set. that looks awesome! can't wait! It looks really nice. My only suggestion would be to try and make the shirt collar look more like a real world constructed shirt. Now that looks really really good! SOLD! Okay... I've come late in this feedback... please know right up front, I don't mean to be the kind of critical that is a put down, not at all. It is only feedback for realism. The arms - jacket sleeves, too short... the ends, too broad... the shoulders... from the collar to the tip of the shoulders - well, the distance is too short. No broad shoulders will fit into that suit. Only narrow awkward looking shoulders. I'm just NOW learning modeling for something I've been wanting for a very long time. So maybe it's because of trying to fit this suit to Genesis which is causing the unrealistic, bloated, puffy look. Perhaps a sleek, tailored looking suit for Genesis is impossible... and to make it look more realistic will require post working, I don't know... I'm just learning. But... I mean this in the most "constructive way" really I do... the suit is off. It's awkward... not yet realistic looking. How to make it so, I haven't a clue... I'm learning myself. For now, the sleeves need to be longer - sleeker... perhaps made in a way that if one is using the entire suit with shirt underneath, the inner sleeves should be gone with only the cuff's showing longer than the jacket sleeves. The shoulder pad area needs to be wider - with a slightly greater distance from the collar end - maybe the collars length and then another length and a half of the collar for measure. The jacket front where it closes, needs to meet more exact. Please don't hate me and feel exagerated... I'm being honest... reason... I need that suit. BUT - I'd rather not have it at all, if I have to do too much postwork to get close as I can to realism. 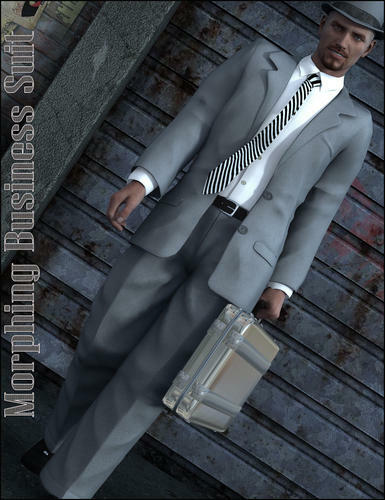 Best suit ever made, was for M3... the 3 piece suit - it simply lacked morphs to make it more serviceable. 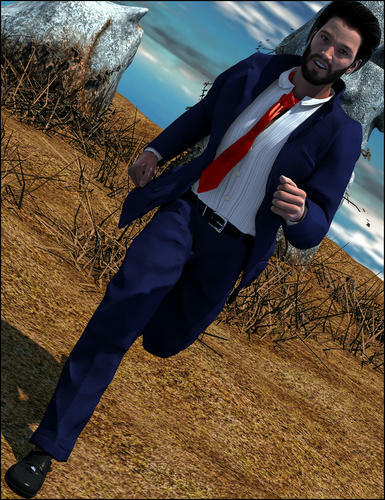 Look at the shoulders on this suit... http://www.daz3d.com/shop/3-piece-suit-for-m3/ - okay... I'm done. Again, this was NOT to hurt feelings, or to discourage your hard work... I know what a struggle it is. BUT - as a buyer, if I pay, I want to be happy with my purchase. The shirt collar has dozens of shaping morphs, so you can make it whatever shape you want it. The shape shown is a morph - one I liked personally. I'm really pleased you are all liking it. I do think it's better for the frustrating to-ing and fro-ing with Daz. 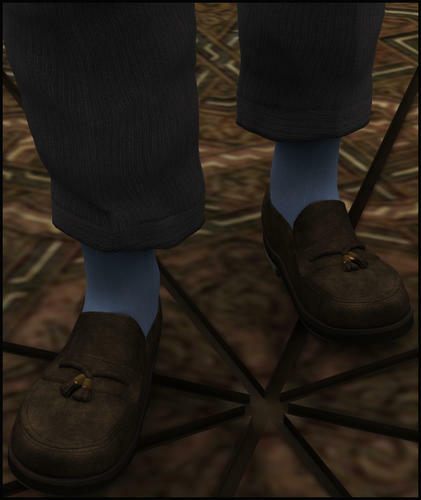 Here's one showing one of the new tweedy textures. Cross post here. This suit has literally hundreds of shaping and fitting morphs. There has never been a suit like it. There are morphs to shorten and lengthen the sleeves. I shortened them for that image because I wanted the cuffs to show. There are morphs to make the shoulders more wide and more square as well. Again, I just spun dials until I was happy with that image. Bloated puffiness is often caused by smoothing. turn it off, and creases become sharper and everything is crisper. Also remember that this is layered and that's really hard to do, and is why the M4 suit jacket, shirt and tie came in one piece. That was a tight suit and everyone complained like crazy about both things. But there are morphs to make the suit tight if that's what you want. It's way harder to make a loose suit work in DS than a tight one. The jacket opens and closes in various ways. There are morphs for this as well. We spent ages with Daz wanting the suit to be more realistic and finally they are are very happy. That was the image they received. But it's just one of many options. You can have tight pants, hipster pants, shorter or longer pants and even bell-bottomed pants. You can change the length and the shaping of the jacket with morphs and the size and shape of the lapels and even pop them and that's just for starters. There has never been a suit like this one. I think people are having much trouble getting their heads around the fact that it has hundreds of morphs and any given image is of what the user (in this case me) has chosen to do with it. And it fits all the girls and even the baby as well. So what I'm saying is that there is really every chance that with the included morphs you can make it look just as you want it to. I don't think we can make it any better than it is now. This render with the open and flying free looks really good! I guess I will have to wait and see. With all the morphs you've mentioned, true - I might find that it is exactly what I'm looking for. So... time will tell, I do know this, I will be purchasing it to give it a go. I for you commend all of your efforts and the textures also look great. Again, time will tell... or maybe, we just need to see more of what it can do, to fully realize the potential! Thank you for showing this other render... looks good! Well, here's a couple more renders that show the versatility. Looking great ladies! I particularly love the black suit in the latest renders Marieah has posted. Thanks - definitely looking more the part. The latter renders show this suit in a more favorable light - now the versatility is more apparent and certainly attractive! Thanks Pen. The black is actually an included pale broadcloth to which you can add your own diffuse color. V5 is wearing a raw silk that is also designed for a user diffuse color. Fantastic...I'm sure that they will still want your textures. 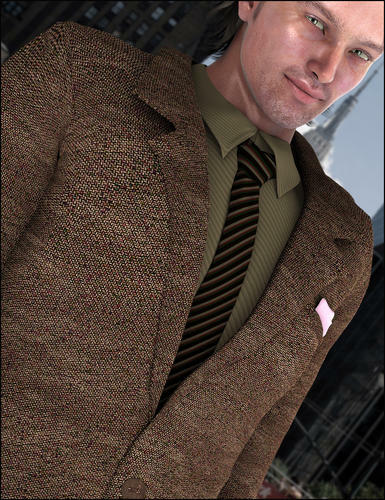 Maybe we need another shader set "Pinstripes, suit fabrics and shirts"
Thanks Pen. I'm going to give the pinstripes as a freebie. The add on will be more velvets, rough tweed with leather patches and maybe even stitched denim...that kind of thing to take it in a different direction. I'll by them. I've become somewhat of a texture and shader junkie. Sorry, I didn't read this properly the first time around. There is such a shader set already. It's called MachPack and it's part of my Fabricator family. It's full of masculine-orientated textures including pinstripes, shirts, denims, leathers, camo, chainmail and even metals. I used some of the tiles to texture this product. It's also really cheap for what it is. This set is great with shaders. 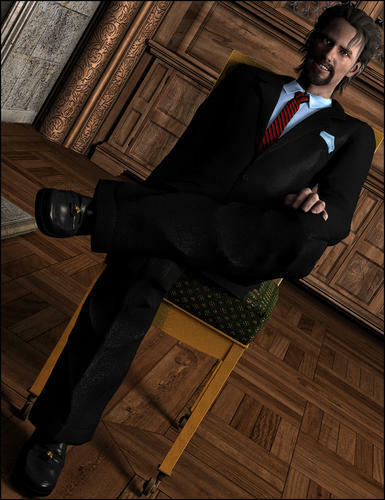 You can just click on whatever tie and handkerchief texture you want. Silkessence is fantastic with it, specially on the waistocat that will be in the first expansion. I've actually used tiled textures for the suit and shirt because I can have a resolution of 6000 by 6000 which is terribly important to minimize distortion with extreme morphs. To achieve equivalent quality using a texture map I'd need a minimum of 10,000 by 10,000 and maybe even more. Fortunately, the important thing about a quality tailored suit is that you can't see any stitching.